This week is a special episode dedicated to a loyal friend of Shane’s. His furry family member passed away on the day of this recording. We dedicate this episode to Lugosi. 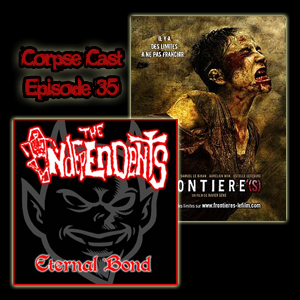 This week we’re talking more horror punk with The Independents. Their album entitled Eternal Bond from 2005. We also find more proof that the French may have a few screws loose as we talk about the Gorefest entitled Frontier(s)… Too brutal for the After Dark Horrorfest crowd, this movie is a complete 180 degree turn in tone from last week’s featured movie.